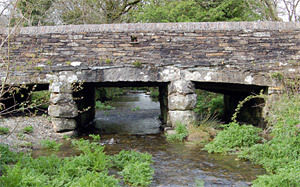 Camelford is an ancient market town on the edge of Bodmin Moor some 5 miles (8 km) from Tintagel. Due to its name it has been linked to the Camelot of the Arthurian legend but there is little historical basis for this belief. However, at the Arthurian Centre in nearby Slaughter Bridge, the family is offered a day out reliving the Arthur legend with the help of photographs, illustrations and paintings. Delabole is a large village some 2 miles (3 km) west of Camelford. It is mostly known for its huge slate quarry which is one of the largest and deepest in Britain and has been in operation since the days of Elizabeth I. A visitor centre permits the general public to learn about slate production and to look out across the massive quarry from a viewing platform.